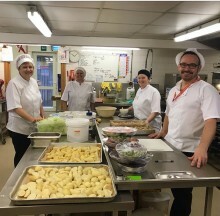 ellenor catering team make Christmas extra special for patients. The most wonderful time of year is almost here – where family and friends come together to celebrate the festive season, perhaps share a meal and enjoy happy times together. Individuals, families and communities across Kent will come together in memory of loved ones at the Lights of Love services in December.